Improving on the guitar, for many guitarists, is the reason for playing the instrument in the first place. The warm, self-satisfied glow inside when you finally see the benefit of all those hours of practising can't be beaten - but all too often those hours are meanderings in the dark: aimless and not actually all that enjoyable. But it really shouldn't be that way. So this lesson (complete with video and tab) is designed to put some life back into your learning. 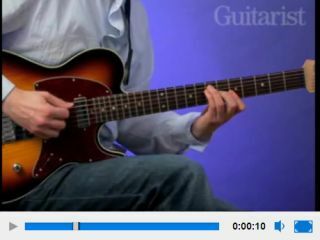 To bring you this lesson, MusicRadar's sister magazine Guitarist asked some of the top guitar tutors in the business for their wit, wisdom and home truths about what it takes to really improve your playing. You'll find 10 of those tips below, and a mammoth 40 more in Guitarist issue 309 - on sale now. Playing chords with triplet rhythms can throw up two performance options - do you use strict alternate picking or a down-up-down, down-up-down picking? Both are valid, but while the former is best at medium-to-high tempos, the latter can often produce better accents. Try the following exercise with both approaches and see which you prefer.